In 1920 the late Venancio "Anciong" Bacon, the founder of Balintawak arnis, opened the Labangon Fencing Club-the first commercial arnis club in Cebu. Following Bacon's, lead Johnny Chiuten, Pedring Romo, and the famous Cañete brothers also began openly teaching their respective styles of stickfighting. The 1920s also found the Philippine Olympic Stadium promoting full-contact arnis tournaments. Placido Yambao reigned as champion in a number of matches held in the late 1920s and early 1930s. Yambao was then to go on and write the first book on arnis thirty years later. It was also during this decade that the United States was given its first glimpse of these fascinating arts. From 1920 to 1929, Ramiro A. Estalilla, Sr. taught Rigonan-Estalilla kabaroan at the Minneapolis Athletic Club in Minneapolis, Minnesota. In 1939, Doce Pares was joined by the six Cañete brothers. 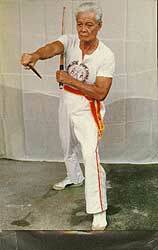 With differences in political view, Bacon left and founded the Balintawak Self-Defense Club. Eulogio "Yoling" Cañete became the new Doce Pares president. 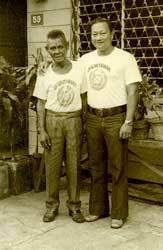 In 1937, Benjamin Luna Lema founded the Lightning Arnis Club in Mambusao, Capiz. Ten years later, in 1947, he was requested by the United States Air Force to relocate to Agana, Guam, to instruct their enlisted men in hand-to-hand combat and arnis. The 1940s also saw the development of the infamous Filipino butterfly knife known as the balisong. In a town in Batangas now known as Barrio Balisong, Perfecto de Leon is credited with developing and manufacturing the first balisong knife. Since that time the balisong has become perhaps the most infamous Filipino weapon. Amador "Mading" Chavez was one disciple who was fortunate to have learned all of the twelve styles. 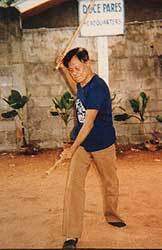 After the Bacolod Arnis Club dissolved, Chavez founded the Chavez Arnis Group in 1959. 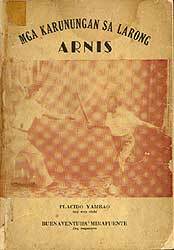 1957 saw the publication of Placido Yambao's book, Mga Karunungan sa Larung Arnis (Knowledge in the Art of Arnis). This book caused quite a stir among Filipino martial arts practitioners, as they still regarded the art as an artifact oftheir unconquerable history. However, Yambao's work did much to promote the art of arnis. 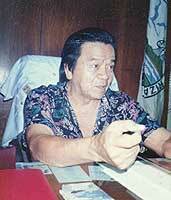 In 1959, Gerardo Alcuzar founded the Durex Self-Defense Club in the Cebu Institute of Technology, where in addition to eskrima, he offered instruction in combat judo and karate.